Those look incredible! I WILL be placing an order as soon as they are available. Full of character! Love the General. These are as good as bacuss's's 6mm – beating the majority of 15mm figsby miles. Any hope of a matching japanese fantasy range? 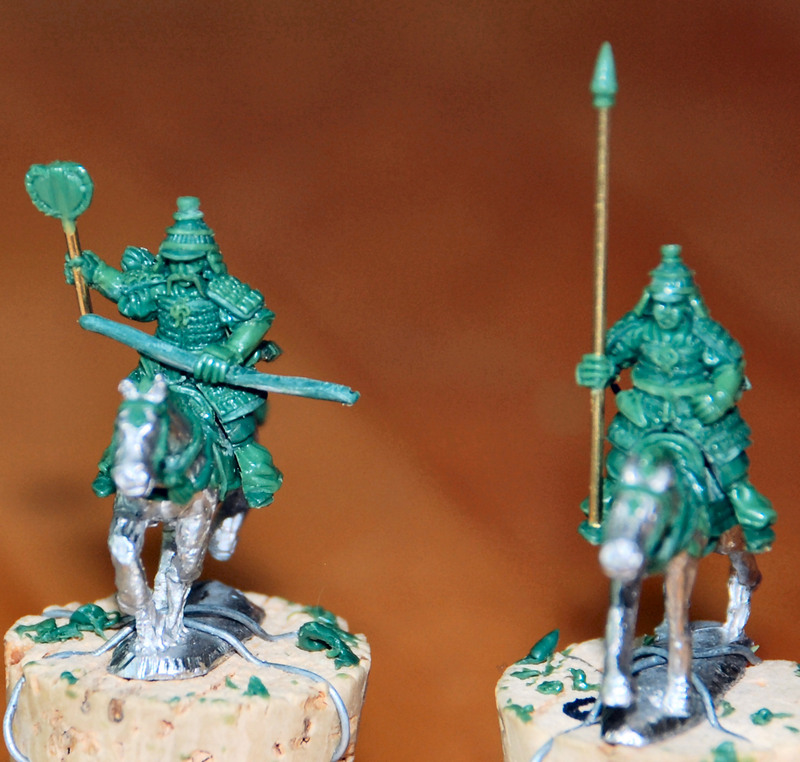 Very nice, actually samurais are less difficult to paint than what I thought. Hi, actually, these are not samurai. Whom do they fight? Koreans? Each other? Yes, and Tang Chinese (in Korea) as well. Also fight the Emishi, of course. Still a little before my time period, but I may buy some anyway! Finally got pics to load. Great poses on the archers! I look forward to seeing the Be archers as well. Unfortunately im waiting to do Kofun Japanese until Eureka does the 3 Kindoms Koreans on their P600 list. Alright! I expect to order a DBA army's worth of this range, once these (and the high command) are in production. Do you have any plans to release a Himiko (?) figure, and/or any menial camp servants or slaves? That's too bad. I have no interest in Iroquis, but would have bought a nice army of Yayoi! Hope you are planning a fully armed (upper body armour, lamellar leggings in 2 parts and horse barding) cavalryman too. See Slingshot 251 and 252: articles by Duncan Head ; Osprey, Early Samurai 200-1500 AD: Plate C number 3: Iwai figure. Evidence that such cavalry was certainly being used can be found in Haniwa figurines depicting such armour. Such a figure would make this great range complete !!!! Hope you will consider such a figure. This is it for the cavalry, phillipus. I am actually making the range in consultation with Duncan, IIRC he opined that armoured cavalry of that type probably isn't necessary for the range. There's also little call for them in either the FoG or the DBMM lists for the later kofun (read Nara) armies. If you want to commission them, however, drop me a note by pm or email so we can discuss. Ancientsgamer, so I am told! I added a blurp on Fanaticus as well about this but I'll add it here. I just love your Pre-Samurai range, but as some others have said, I need a 2/3rds complete DBA Army like I need another hole in my head. I've been anxiously awaiting for the Cav figures to be available. I'm still not sure what I'd use for the Arty for the III 7 b option? All that aside, I'm so happy you went forward with this range, it's my favorite by far, but didn't want to get the foot painted and not able to complete the project! Your figures are so nice, I just couldn't stand having to use lesser models mixed in. It would just ruin the whole thing lol. Any word on when the Cav will be available for purchase? Actually, I have been looking for some pre-colonial Iroquois, so I am excited to hear about them coming out. Yayoi would still be amazingly cool though.